Carriers and other network operators should be able to offer some services using the Citizens Broadband Radio Service spectrum as soon as next year. Vendors have developed software to manage and assign CBRS spectrum dynamically, and are now preparing for a certification process with the Federal Communications Commission. The CBRS spectrum, bands 3550 MHz to 3700 MHz, will be allocated in three tiers. 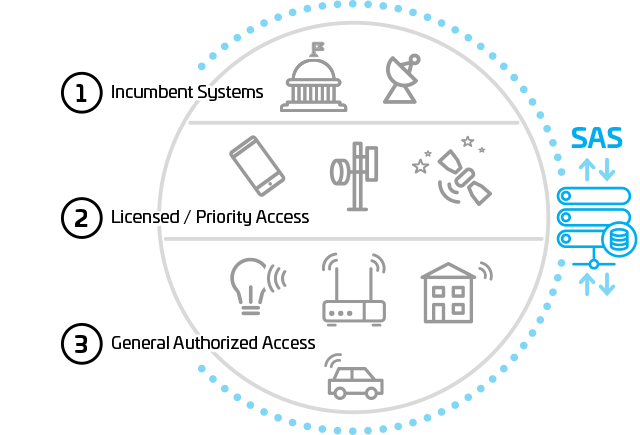 Tier 1 is for incumbent users, including the Department of Defense and fixed satellite service providers. Tier 2 will be licensed for commercial use – priority access licenses will be assigned through an auction process. Tier 3 will be generally available to any users who can deploy the spectrum without disrupting service in the two higher tiers. According to Mark Gibson, senior director of business development for CommScope’s Comsearch unit, operators will start with the Tier 3 spectrum, called General Authorized Access. He said GAA gives operators a way to “kick the tires” before committing to the auction process. All new commercial deployments in the CBRS band will need to use software to make sure that they do not interfere with incumbent users of this spectrum, or with one another. Two cloud-based software systems will enable CBRS: the spectrum access system (SAS) and the environmental sensing capability (ESC). The SAS manages and assigns spectrum dynamically, and the ESC informs the SAS of U.S. Navy radar operations so that commercial operators can avoid interference. Gibson said network operators will need to buy the SAS and the ESC as a package from one vendor. However, SAS vendors who do not have an ESC capability can buy it from a competitor and integrate it with their SAS, if the competitor is willing to share. Gibson expects authorization from the FCC to be in place for Comsearch by the third quarter of 2018, and he thinks providers will begin offering service using the free CBRS bands right away. “There’s lots of interest across the board with the wireless carriers,” Gibson said. “On the non-traditional side I think we’re seeing a lot of interest from what you might call enterprise providers that don’t historically run their own wireless network, like Wal-Mart, Costco.” Gibson said some of these enterprises might try to build their own networks, while others will turn to third-party providers. Comsearch works most closely with the wireless carriers, traditional customers for parent company CommScope’s fiber, cable and antenna businesses. Other leaders in the SAS arena come from very different backgrounds. Google is more of a competitor to the carriers than a supplier, but the company does have experience with spectrum management. Federated Wireless is a company dedicated to helping network operators manage the shared CBRS spectrum. Tarazi spoke with analyst Monica Paolini as part of her recent research report on CBRS. He said CBRS radio hardware is almost ready for market, and SAS systems are not far behind. “I expect that the final form factor of the chipsets will come in the fourth quarter of this year into the first quarter of 2018,” Tarazi said. Network operators and infrastructure providers are ready. ExteNet Systems and Cal.net have already announced plans to deploy a CBRS network.